This work, also called Kit-Kong, was made in June 2000 as a present for Lucy Taylor. The picture combines a still from the 1933 King-Kong and the Japanese toyfigure Hello Kitty. 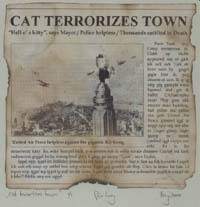 The text contains the titles "Cat terrorizes town" and "(...)Thousands cutified to death", some scraps of real sentences, e.g. "Cute, says Taylor" and garbled talk which was taken from the German version of Little Nemo.